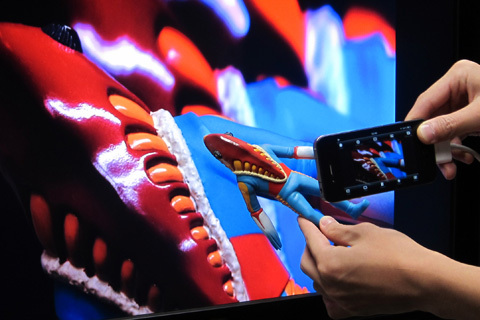 “CameraVision” outputs the images of the built-in camera and the corresponding sounds from the built-in microphone to an external device such as a projector or a TV monitor. 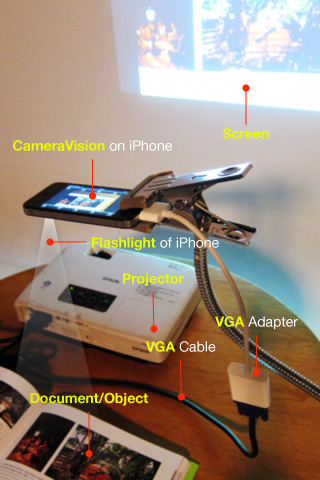 This application can be used similar to a “document camera (overhead projector)” or a “live camera” to project documents, objects, people or scenes onto a large screen. 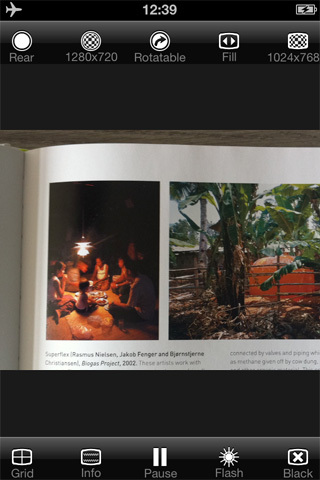 In addition, showing a still image from Photo Albums is possible. A Dock/Lightning-connector adapter/cable can be used and the wireless transfer to Apple TV (AirPlay) is also supported. This application has the functions listed below. You can set them up easily using the buttons on the screen. 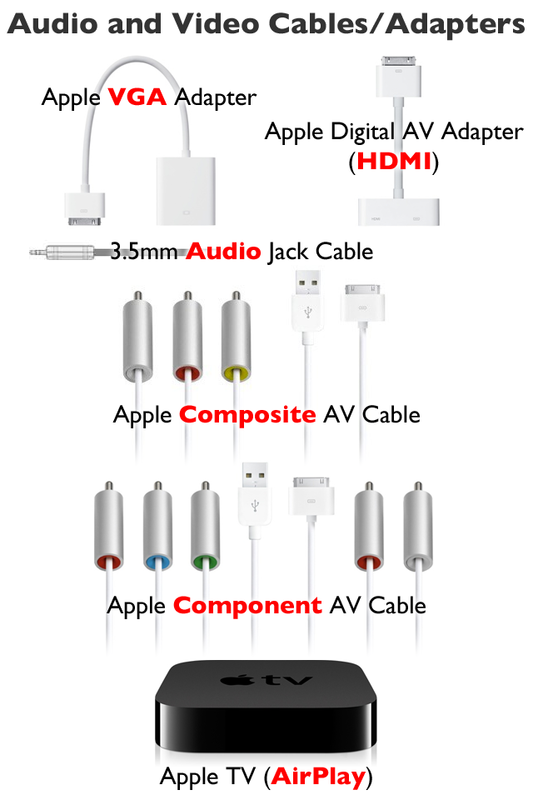 * These functions depend on devices and adapter/cables used. 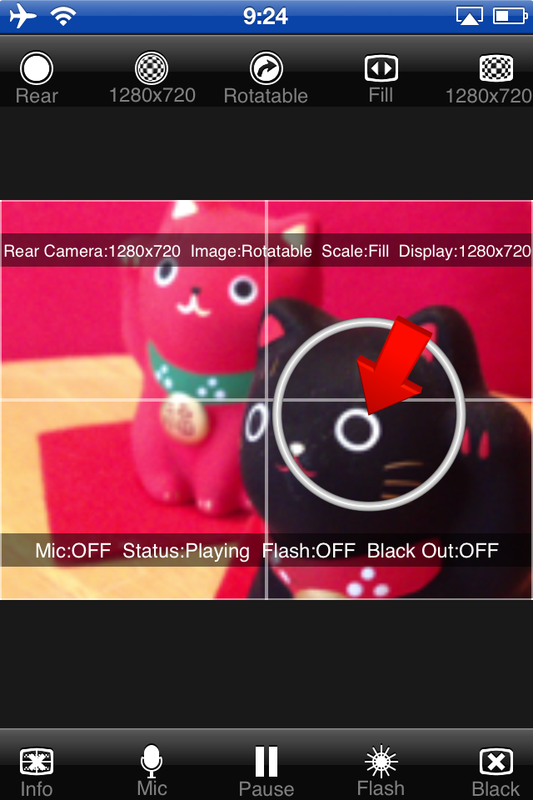 For example, the resolution of the front camera of an iPhone 4 and an iPod touch (4th generation) is SD (640×480 pixels). An iPod touch (4th generation) dose not have a flash light, and so on. * Please unplug and then plug your dock adapter/cable if no image is shown on the external display properly. * Microphone input can be sent to an external speaker via HDMI, Composite or Component cable with the camera image. 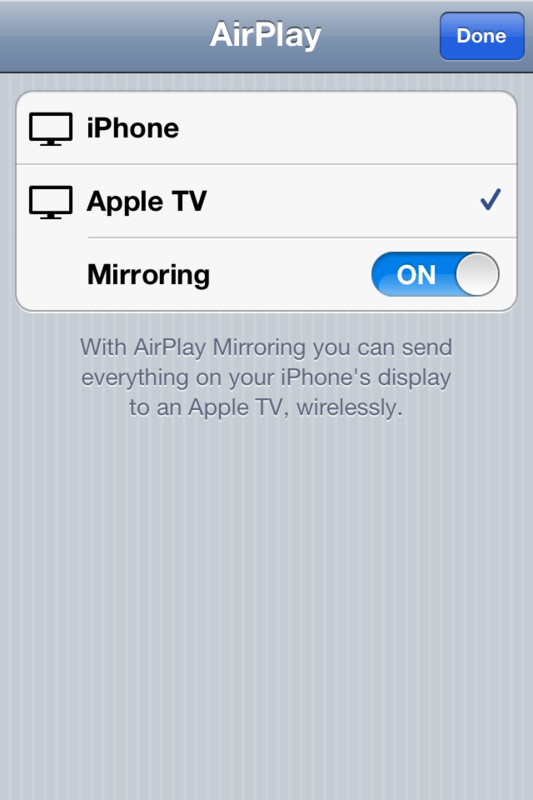 It can be sent wirelessly to Apple TV (AirPlay). When using a VGA cable, plug an audio cable to iPhone’s headphone jack. * To work with Apple TV, tap the home button twice, then go to the leftmost page, tap the AirPlay button, select your Apple TV and turn on mirroring. iPhone 4 and iPod touch 4th generation doesn’t support AppleTV. CameraVision은 아이폰 내장 카메라와 마이크를 통한 영상과 음성을 프로젝터 혹은 TV 등의 외부기기로 출력하는 어플리케이션입니다. OHP(오버 헤드 프로젝터)처럼 서류 혹은 여러 사물들을 프로젝터를 통해 영사하거나, 라이브 카메라처럼 인물이나 풍경을 TV에 표시하는 것이 가능합니다. 또한 앨범에서 사진을 선택하여 큰 화면에 표시하는 것도 가능합니다. 비디오 어뎁터와 비디오 케이블을 통한 외부기기와의 연결은 물론, Apple TV를 통한 무선 연결(AirPlay)도 가능합니다. 이 어플리케이션은 이하의 기기에서 동작합니다. 이하의 어뎁터, 케이블이 이용 가능합니다. 이 어플리케이션은 이하와 같은 기능이 있으며, 스크린상의 버튼은 간단히 설정할 수 있습니다. * 위에서 언급된 기능은 디바이스와의 접속에 사용된 어뎁터, 그리고 외부기기의 성능에 따라 달라집니다. 예를 들어, iPhone 4와 iPod touch(4세대)의 전면 카메라의 해상도는 SD (640×480픽셀)로 설정됩니다. 또한 iPod touch (4세대)에는 플래시 라이트가 구비되어 있지 않습니다. * 외부 디스플레이에 영상이 제대로 출력 되지 않을 경우에는, 어뎁터 혹은 케이블을 빼었다가 다시 연결해 주십시오. * 마이크 음성은 HDMI, Composite, Component 케이블을 사용하여 외부기기의 스피커로 출력 하는 것이 가능합니다. 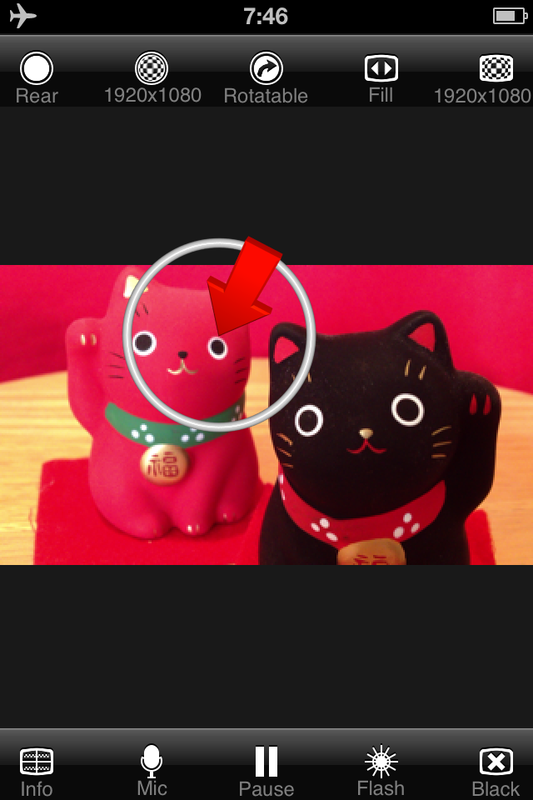 Apple TV(AirPlay)를 사용할 경우에는 무선으로 출력이 가능합니다. VGA어뎁터를 사용할 경우에는 iPhone 헤드폰 단자에 오디오 케이블을 연결하여 사용해 주시길 바랍니다. * Apple TV에 접속하기 위해서는, 홈 버튼을 두번 누른 후, 가장 왼쪽 페이지의 AirPlay 버튼을 선택 후, Apple TV를 선택하여 미러링 기능을 켜주시길 바랍니다. iPhone 4와 iPod touch 4세대에서는 Apple TV를 지원하지 않습니다. What kind of clamp is holding the iPhone? Hi Kathy, I’m using a cheap clamp as below (it’s in Japanese). Of course, you can use any clamp. I absolutely love this app. So clean and well done. Any chance you might consider adding audio output from the microphone? Better yet, maybe you can add background audio support for Echochops. This would allow me to set the audio delay to 0, then switch to CameraVision to have both audio and video out the dock connector. Hi Gordon, It’s so nice idea. I must consider it seriously. I’m planning to use this to show/teach a class on how to use an iphone/itouch. Will this allow me to zoom in for extra details? Hi Freddy, No zooming function. Sorry for that. Dear Gordon, Echochops 1.2 has been released. It supports background audio. Thank you for waiting. Any chance in the future for this to work with Apple TV and not need cords? 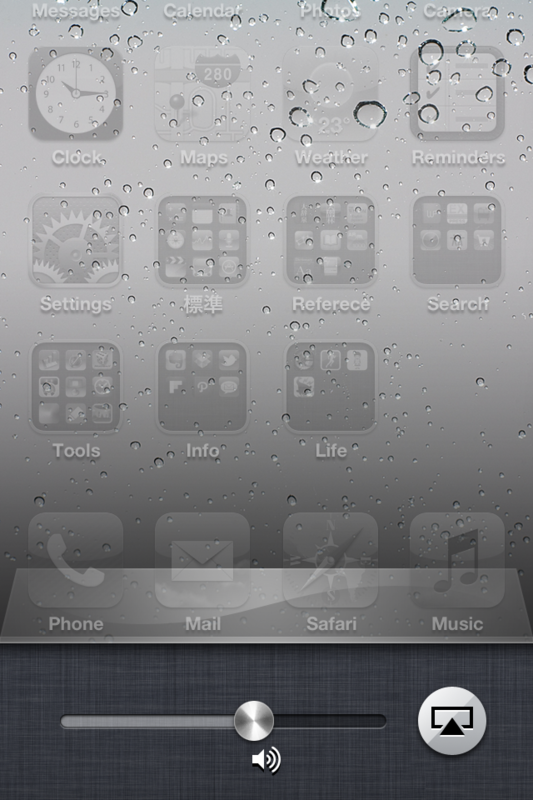 Dear Joferger, It works with AppleTV if you are using iPad2 and/or iPhone 4S. Congratulations for your great App!! I will use it LIVE in my new stage show but I miss the option to play my VIDEOS from the CameraVision App itself, like we can do with the PHOTOS. My stage show premiere is next February 2. There are some possibility to build and (urgent) Update that allows the commented option? Thanks in advance and my best wishes for you in 2012!! 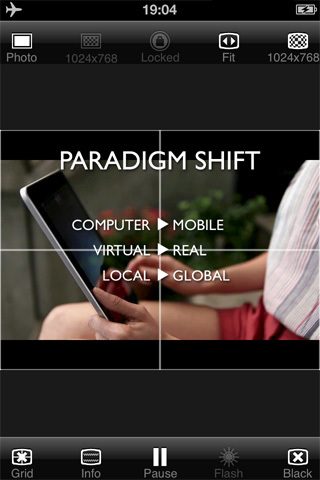 You will be the first with an All-In-One App of this kind…!! Hello , I’m having a lot of difficulty to operate the Cameravision app . I have an Iphone 6 more , I’ve used the AV composite cable CABLE , DIGITAL HDMI adapter, VGA and AIRPLAY . I could not make it work , the picture will not for screen and app does not appear the monitor. Could you give me an Aid ??? I’ve confirmed with the iPhone 6 connectivities (except with he AV composite cable cable). Would you try it with another monitor and/or projector? The app works fine with iPod touch (6th gen) and Apple TV (4th gen). I checked it a few month ago and I’ll check it again for iOS 10 some day soon.